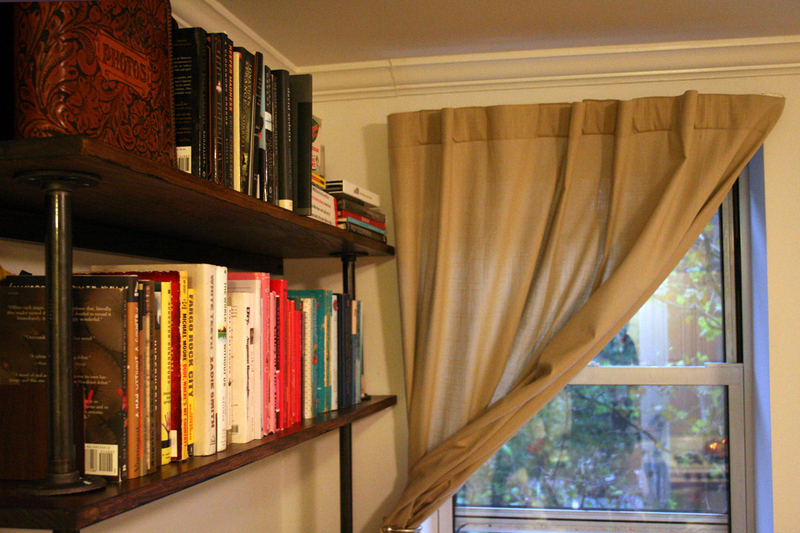 after entirely too much time spent vacillating over this book shelf or that one – scouring IKEA, crate & barrel, cb2, west elm, vintage stores, you name it. . . (yes, i admit: i am one of those people always searching for the *perfect* solution + have a challenging time settling on the first thing i come across, even if it is *best*) i made my own. with some bonus time on my hands, the DIY route felt right. thanks to design*sponge + apartment therapy, i gained confidence plus inspiration. 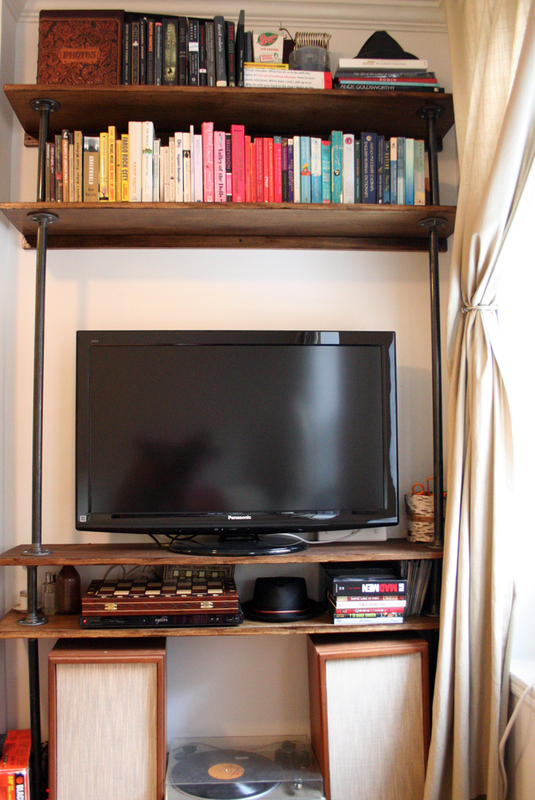 all in all, she came out to be pretty sturdy [fingers*crossed] of course if i could do it all again, i would have the pipe cut to size and threaded, because i don’t totally love the blank space above the tv – but for a first go at furniture, i’m really really happy with it. 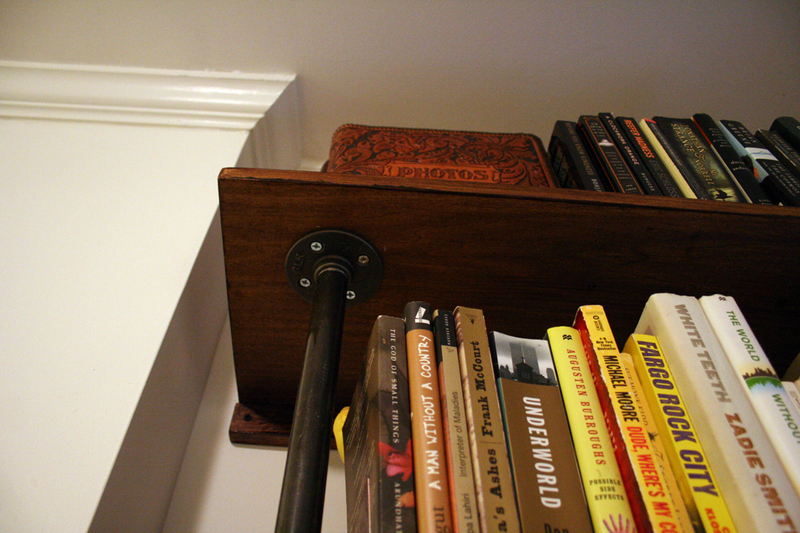 next i’d like to make a small box to house our records below the receiver. ideally, the speakers wouldn’t rest on the floor – but it’s a manhattan apartment, it is what it is. +special thanks to brothers gibson for the person tips! Nice! Man I wish I were good at the DIY stuff…I’m sure mine would end up lopsided! 😉 Thank you for sharing. While I’m very impressed with your construction skills I’m probably more impressed with the fact that you have a turntable. A legitimate old school turntable. Cheers! Good Job! It looks nice! Very open and organized…I love it! Nice! My husband can do things like this, which I appreciate so much! I love your record player! 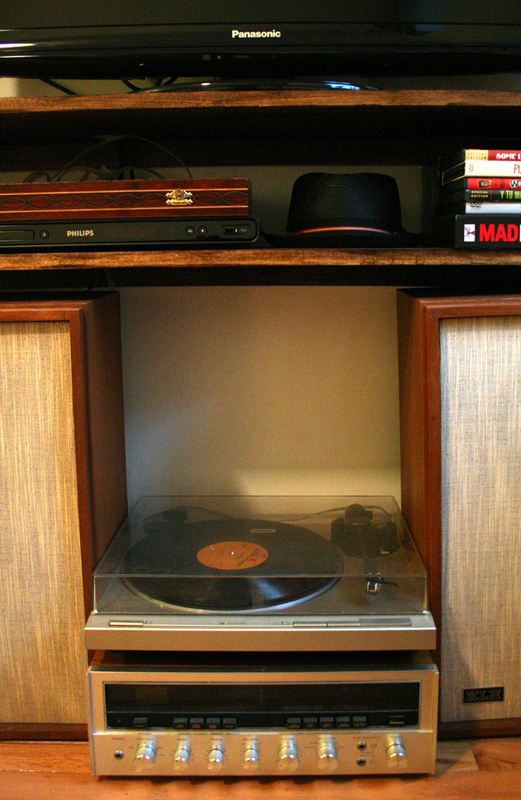 And have been contemplating making a shelving unit for my records… thanks for the inspiration! Nicely done…do you know how long it took for you to get it all together? Fabulous. It’s so nice to be able to do things for ourselves. I would never attempt something of that magnitude. I have been staring at an emtpy wall all morning trying to think of who to make some shelves or storage of some kind to put in the space. So Kudos to you. Looks great. Good for you…DIY are so rewarding and you look like you did a great job. It looks a little beyond me, but Thank God I don’t need any furniture, Ha, Ha!! I agree, the turntable is very impressive. ROCKIN’ AWESOME your books are!!! You put them in rainbow color order. Wow. You are just too cool. wow! this one is cool! I hope I could have like this kind of shelf at home… space saver! Very nice. Sometimes doing projects from scratch can be expensive (more expensive than buying premade) and sometimes not. It all depends upon what you’re making and what you want – style, materials, etc. I like your use of materials and design. Very low key, utilitarian yet pretty. Looks pretty sturdy too, which is a big plus for shelving. Very nice! Can I ask what kind of wood that is? Nice. It’s very organized and simple. Like it. Thaks for sharing. Wow, VERY impressive for a first attempt at furniture…Well actually just impressive in general! I would love to try something like this – any suggestions for starting out? Ok now you can come over and build one for me! lol. I have tons of books, I just cant bear to get rid of any of them and I have them stored in boxes, but I would love to have shelves built for them. Very nice. GREAT JOB. it looks fancy and it does the job. very cool build. Wow. Wish I were so organized and crafty. Kudos to you. I MUST get some order in my life, or I will totally spaz out. I also love the fact you color-coordinated your books. Ah, sweet bliss. How I love order and harmony. Strong work. What you can be most proud of, I think, is your ability to ask for help, get opinions and gather resources and then DO IT. This is how great things get done. Also, check this out http://bookshelfporn.com/. Good for you. Good first effort. I’m sure it cost a lot less than any prepackaged unit. The more you do DIY, the more confident you become. nice looking and fits the decor. great job. Love the color-coded books! Very nice colors in these pictures. I am ascairt of DIY…that’s why I married up. Nicely done. What’s on the box? This looks great, and is inspiring. I may make something like this for our new place! Isn’t it satisfying to take on a project and have it turn out? Bravo! and Congrats on being Freshly Pressed!! Nice! Making things for yourself is a great way to be sure they suit your needs. Like someone else, I am totally diverted by your book display. And I actually recognize some of the spines as books I have written. Oh yeah, the shelves really are cool. Congrats! Looks stylish and very practical! you know, ever since I was little I’ve always wanted a library in my house that was beauty and the beast inspired. that one that the Beast gave to Belle as a gift. the timing: it *could* have taken less than a weekend (probably even a day if I were ambitious) .. but i’m slow to do things so realistically it took about two weeks – very spread out. Wow you can come by and decorate my place any time.That looks great! Great job! What’s your next project? Love the openness of this project and the stain you chose. So nice that you could make it to fit this space perfectly and get the most use out of it. Perhaps you could have a photo cropped to fit in a little smaller than the bare space above the T.V. that you want to fill. Either put it in a frame and set directly on top of the T.V. (unless it’s too narrow)or mount it to the wall directly. Or some other kind of art. Nice job! very nice job…………have you given thoght to your own line ? great job! DO it youself,then you will realize you value. while the shelf itself is awesome, the fact that you own both mad men & y tu mama tambien creates even larger levels of respect. Well done you! Looks great. So fun and it fits your space – perfectly. Congrats on being fresh pressed. Nice! I love how the books are color coordinated. Hi. Great work with your shelf. Not only it looks great, your have done a great job with taking those wonderful pictures as well. Easy peasy DIY – right up my alley. Beautiful! Looks like it came right out of a design magazine.! Hey this is the first time in my life I’ve seen books displayed by color and I commend you! You must be an artist. Your shelf looks great. Good for you! DIY is always better than plunking down your hard earned plastic at a big box store. Love the turntable, too. I am super inspired! I am stuck in a silly place where my bookshelf is just 3 books too small. The fun thing is I rotate those “loose” three so I’m always reading (or re-reading) something. Now seems like the right time to make another shelf so the collection can grow again. Really cool, nice idea and you have done it. I’m also reffering design*sponge stuff and love it. That is pretty cool. I wish I had wood working skills. But I don’t lol. I’m pretty darn good with some knitting needles and a crochet hook though. 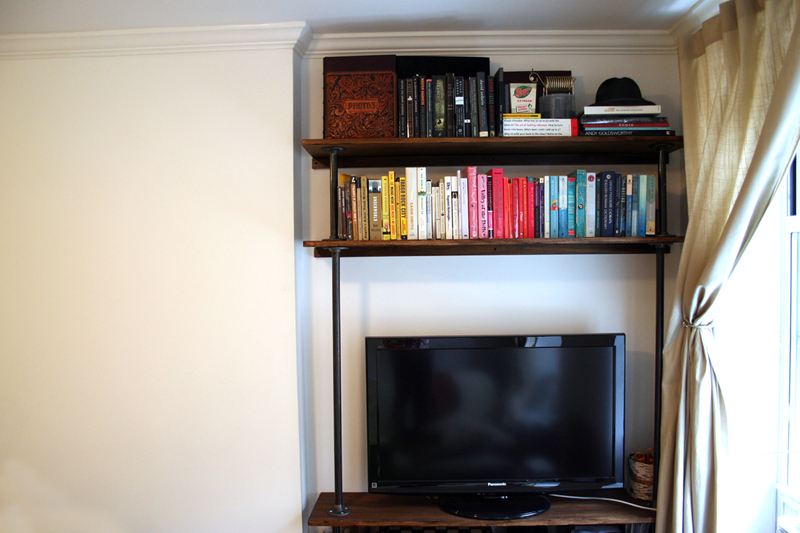 I made a bookshelf once… the middle shelf was lopsided and the spacing was uneven… I am in awe/so jealous of yours. Looks like something from Ikea! nice job! And you got exactly what you wanted! I am in awe/so jealous of yours. Looks like something from Ikea!